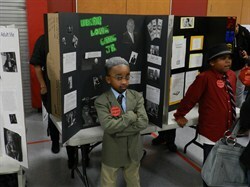 On Friday, March 8th, third-grade students at Rowland Elementary School showcased their acting and presentation skills by presenting a Living Wax Museum. Each student selected a historic or modern day African-American to portray in-character, complete with make-up, props, and costumes. A wide range of famous and influential African-Americans were represented at the exhibit, including Jackie Robinson, Aretha Franklin, Harriet Tubman, and President Barack Obama. At first, parents and teachers entering the school gymnasium encountered each student in a frozen position, until their “Push Play” button was pressed, upon which the student sprang to life, presenting a short story about their character’s life and important contributions to society. Visitors to the exhibit also had the opportunity to view colorful and informative display boards created by the students for their historic figure. Congratulations to the third grade students at Rowland Elementary School for their informative and entertaining presentations!